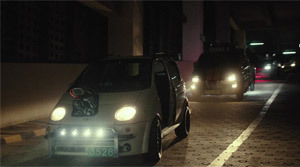 Story: Kwon Yoo (Ji Chang-wook) is an unemployed young man who spends his days with computer games in which he is known as "Captain" among his online friends. However, one day the police storm his room, rudely wake him from his sleep and take him into custody. He is accused of having raped and killed a minor. Apparently, someone has framed him for the crime since there is fingerprints and additional overwhelming evidence found against him. He gets a life-sentence and meets gangster Ma Deok-soo (Kim Sang-ho) in prison who has it on for him. Kwon's mother hasn't given up on her son, yet, and asks him to hang in a little bit longer since she is still trying to prove his innocence. But suddenly Kwon is informed about his mother's death through his lawyer Min Cheon-sang (Oh Jung-se). The young man is devastated, yet makes a plan. He manages to break out of prison and when he is free he looks for the men who have framed him with the murder. It soon turns out that he has no chance on his own, though. Fortunately, he is contacted by Mr. Hairy (Shim Eun-kyung), who he knows from his online games. In fact, he really is a young woman, who also is an extraordinary hacker. She mobilizes the other online gamers in order to prove Kwon's innocence. Review: "Fabricated City" is one of those movies that will fare better with general audiences than with critics. Reasons for that are evident. The ideas in this rapid-fire action film are interesting, but aren't made use of befitting their inherent potential. The characters are by no means boring, but particularly in this respect there could have been done more in order to make the flick emotionally more engaging. Next to that, the picture covers too many genres for successfully presenting itself as a coherent whole in the end. 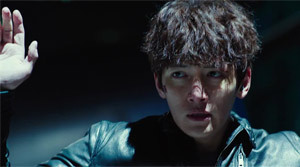 And still: "Fabricated City" is one of the most innovative action pieces coming out of Korea these last few years, although the story might not be reason for that. But under the action-oriented surface there is also some socio-criticism which seems to be en vogue on Korean screens after the president's impeachment. Anyway, this is a good way to be well entertained for 126 minutes. The film starts off with a breathtaking action sequence that looks like a mix of 80s-action flick and video game. And the sequence just turns out to be the latter. After that our hero is falsely convicted, ends up in prison, is almost mentally broken, makes the acquaintance of one of two of his future nemeses there and eventually breaks out. And all of that within the first 35 minutes of the picture! 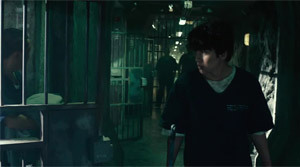 The atmosphere in prison is rather dark, but then "Fabricated City" becomes a hacker film in which a small group stands its ground against a corrupt system. So it becomes pretty clear that Park Kwang-hyeon ("Welcome to Dongmakgol") has some serious issues getting his grip on a clear focus. It's almost as if he had the attention span of a millennia kid. While the different flavors of the ice-cream cone may be well achieved they clash when they melt together. 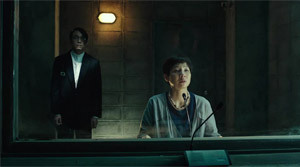 Another example for this is a very nicely staged brawl in the dark, in which Kwon Yoo suddenly develops a supernatural sense of hearing that could even compete with that of "Daredevil". This may be thrilling, but it also makes you scratch your head. Also, considering the sophisticated details of the plot and the villain you have to constantly ask yourself whether the movie is based on a manga or not. Oh Jung-se ("Running Man") almost exaggerates things when madness is flickering in his eyes, but it's fun and there is no real overacting. At the same time the hacker group stands as a neat mix of individuals, whereas especially Yeo-wool, played by Shim Eun-kyung ("Miss Granny"), plays with the viewer's expectations and thankfully doesn't take on the role as the hero's love interest. Well, at least not on screen, but probably after the credits. Ji Chang-wook, mainly to be seen in drama series, delivers a good hero, but when taking a closer look he still lacks a few more distinctive character traits. At least, his relationship to his mother makes us emotionally partake in his unjust fate. Next to that criticism on a society in which the rich and powerful can do anything is implemented well into the movie, too. And the social outcasts rise against this sort of injustice. Naturally, something like this always strikes a chord and gives us a feeling of (self-)satisfaction. Even though the movie may at first make us assume that it centers around video games this is not the case. This is a bit irritating, though, since this means that there is still no big budget flick about this subject from a country where professional gamers win millions in computer game contests or in which addiction to those games is a big (hushed up?) topic. Yet, our heroes have no need to escape their boring everyday life by entering the virtual world since their reality is filled with shootouts and especially fantastically captured car chasing scenes. Moreover, there are a few technical gadgets they use in their missions, which would make any intelligence unit go green with envy. 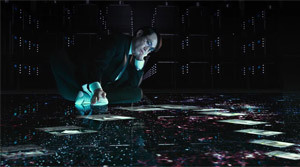 All the gadgets along with the wonderful score by Kim Tae-seong also give the movie a slight sci-fi coating and yet leaves no doubt that the transparent citizen is not the notion of a dystopian future anymore. Despite great action and its epic scale, which is achieved thanks to several genres finding their place here, the movie still seems a bit too long with its 126 running time, also since the different parts don't gear into each other that well. Nevertheless, "Fabricated City" brings the long awaited fresh breeze into the Korea action genre. Without its countless problems this movie even could have become a masterpiece.